A Successful Search for a Coat of Arms! Ecclesiastical Heraldry in the News! 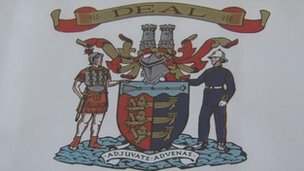 Deal Borough Council disbanded in 1974 and Deal Town Council was formed in 1996. According to the College of Arms, because the present town does not have the same area as the former Borough, a simple transfer of the arms is not possible. 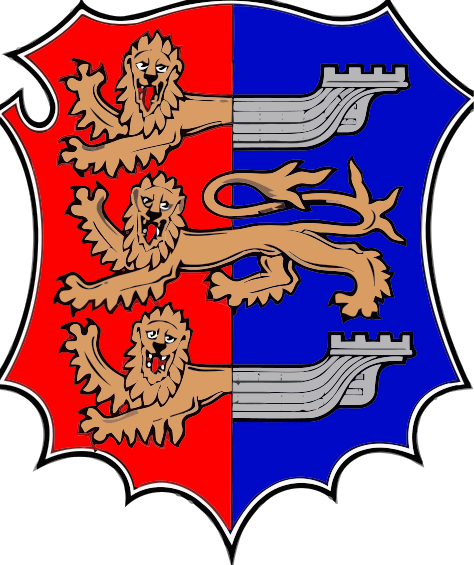 Deal Town FC, which also uses the coat of arms, has been told the emblem on their shirts will have to go. Club chairman Dayle Melody said: "Immediately we could just put a patch over the face of it and be badge-less, but that's not something we want to do. ... "It all depends how far the authorities want to go with regards to making us take it off. We've got five kits so that's £4,500 that we'd have to find to replace the kits." A related article at KentOnline, noting the use of the arms by the Deal Victoria and Barns Close Cricket Club stitched into ties, blazers and on a large flag, is also entering the fight to keep using the Deal Borough coat of arms. In a follow-up article in This Is Kent on February 27, the Deal Town Council has voted unanimously to opt for the cheaper (than the £10,000 they said it would have cost to change the arms) option of taking on the Cinque Ports arms, personalised with the town name and motto. The trouble, of course, is that the image that they link to in the article is not the arms of the Cinque Ports, but the arms of Hastings, which is only one member of the Cinque Ports Confederation of Hastings, New Romney, Hythe, Dover, and Sandwich. This is the Hastings arms. 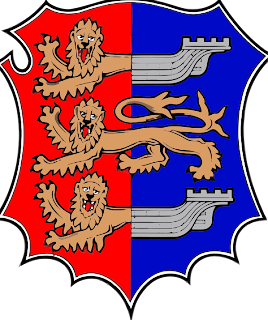 I am assuming that what they are actually doing is dropping the charged chief from the old arms of the Borough and adding the town name above and motto below the shield, and not taking the arms of Hastings (which are differenced from the Cinque Ports by having a whole lion passant guardant in place of the center lion/hulk dimidiation). 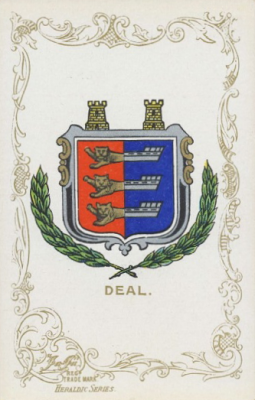 In other words, going back to what the Deal coat of arms was a little over a century ago, as you can see in this postcard from the very early 1900s.